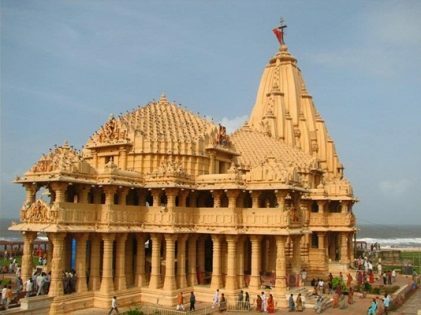 Since ancient times, Somnath temple has been renowned for its significance in Hinduism, its grandeur, wealth and sacredness in the contemporary era. This very reason inflicted lot of attacks, looting, destruction by invaders. 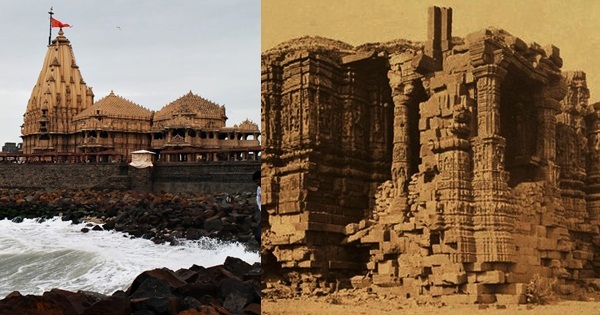 According to popular tradition documented by J. Gordon Melton, the first Siva temple at Somnath is believed to have been built at some unknown time in the past. The second temple was said to be built at the same site by the Seuna kings of Vallabhi around 649 CE. In 725 CE, Al-Junayd, the Arab governor of Sindh is said to have destroyed the second temple as part of his invasions of Western India and for cause of Islam. The Gurjara-Pratihara king Nagabhata II is said to have constructed the third temple in 815 CE, a large structure of red sandstone. The Solanki king Mularaja possibly built the first temple at the site sometime before 997 CE, even though some historians believe that he may have renovated a smaller earlier temple. In 1024, during the reign of Bhimdev I, the prominent Afghan ruler Mahmud of Ghazni raided western Indian state of Gujarat, looted and destructed the temple. To inflict disrespect to infidels (Hindus) at maximum level, Mahmud personally hammered temple’s main deity to pieces and stone fragments were carted back to Ghazni where they were incorporated in the steps of city’s new Jamiah mosque. He took away a booty of 2 crore dinars. However, powerful legends with intricate detail had developed regarding Mahmud’s raid in the Turko-Persian literature, which “electrified” the Muslim world according to scholar Meenakshi Jain. The prior temple appears to have been a wooden structure which decayed in time (kalajirnam) and Kumarpal (r. 1143-72) rebuilt it in “excellent stone and studded it with jewels,” according to an inscription in 1169. In a rare description of the scene of a temple destruction, like of which continued to occur time and again during the long and disastrous rule of the Islamist rulers in India, we have the following account. “The Mlechchha (asura) stone breakers”, writes Padmanabha in his classic work “climbed up the shikhar of the temple and began to rain blows on the stone idols on all three sides by their hammers, the stone pieces falling all around. They loosened every joint of the temple building, and then began to break the different layers (thara) and the sculptured elephants and horses carved on them by incessant blows of their hammers. Then, amidst loud and vulgar clamour, they began to apply force from both the sides to uproot the massive idol by means of wooden beams and iron crowbars” (Kaanhadade Prabandha, Canto I, vss. 94-96). The temple was rebuilt by Mahipala Deva, the Chudasama king of Saurashtra in 1308 and the ShivaLinga was installed by his son Khengar sometime between 1326 and 1351. In 1395, the temple was destroyed for the third time by Zafar Khan, the last governor of Gujarat under the Delhi Sultanate. In 1451, it was desecrated by Mahmud Begada, the Sultan of Gujarat. Each time it was destroyed, it was rebuilt – mostly in small scale and sometimes in grand scale by backing of Hindu rulers and merchants. In 1546, the Portuguese, based in Goa, attacked ports and towns in Gujarat including Somnath and destroyed several temples. By 1665, the temple, one of many, was once again ordered destroyed by Mughal emperor Aurangzeb. In 1702, he ordered that if Hindus had revived worship there, it should be demolished completely, and mosque to be built on the same place of temple. Later the temple was rebuilt to its same glory by the joint efforts of the Marathas including the Peshwa of Pune, Raja Bhonsle of Nagpur, Chhatrapati Bhonsle of Kolhapur, Queen Ahilyabai Holkar of Indore & Shrimant Patilbuwa Shinde of Gwalior rebuilt the temple in 1783 at a site adjacent to the ruined abandoned mosque built upon original temple by Mughal emperor Aurangzeb. Most recently it was rebuilt in November 1947 at the same original site, when Vallabhbhai Patel – the 1st Home Minister of Independent India visited the area for the integration of Junagadh princely state and mooted a plan for restoration as per the historic descriptions about architectures of older temples. The temple was completed and inaugurated in May 1951. 3) Gwynne, Paul (2009), World Religions in Practice: A Comparative Introduction, Oxford: Blackwell Publication, ISBN 978-1-4051-6702-4. 4) Harding, Elizabeth U. (1998). “God, the Father”. Kali: The Black Goddess of Dakshineswar. Motilal Banarsidass. pp. 156–157. ISBN 978-81-208-1450-9. 7) Vivekananda, Swami. “The Paris Congress of the History of Religions”. The Complete Works of Swami Vivekananda. Vol.4. 8) Thapar, Romila (2004). Somanatha: The Many Voices of a History. Penguin Books India. ISBN 1-84467-020-1. 10) Dhaky, M. A.; Shastri, H. P., eds. (1974). The Riddle of the Temple at Somanatha. Bharata Manisha. 12) “Jay Somnath”. Official website of Somnath Temple. Retrieved 12 April 2015. 13) Gopal, Ram (1994). Hindu culture during and after Muslim rule: survival and subsequent challenges. M.D. Publications Pvt. Ltd. p. 148. ISBN 81-85880-26-3. 14) Melton, J. Gordon (2014). Faiths Across Time: 5,000 Years of Religious History. ABC-CLIO. pp. 516, 547, 587. ISBN 1610690265. 15) Meenakshi Jain (21 March 2004). “Review of Romila Thapar’s “Somanatha, The Many Voices of a History””. The Pioneer. Retrieved 2014-12-15. 16) Temples of India. Prabhat Prakashan. Retrieved 1 November 2014. 17) “Mosque and Tomb of the Emperor Sultan Mahmood of Ghuznee”. British Library. Retrieved 1 November 2014. Featured image courtesy: Wikipedia and mouthshut.com. Abhijeet Arvind Talegaonkar is a passionate admirer of Indian history, architecture, sculptures and paintings, dance and music, literature and poetry including Vedantic and Bhakti movement.